1) If the car has bugs, spray the area with presoak first. 2) Spray your wheels and tires with tire cleaner. 3) Use the soap cycle (high pressure) to flush away lose soil, dust and bugs. 4) Use the foam brush to loosen road film and grime. 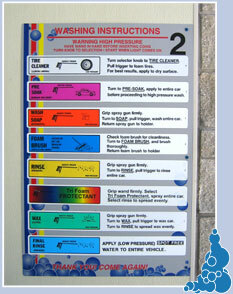 5) Rinse the entire vehicle. 6) Use the spray on wax at this time if needed. Always start at the highest point of the car and work your way down. Keep the spray nozzle approximately 6 inches from the vehicle never closer then 4 inches. 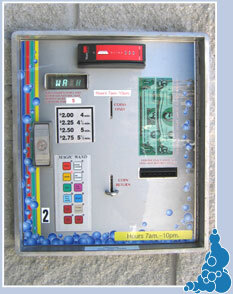 Always finish your wash cycle with spot free rinse to eliminate water spots when drying.